The Playing Fields are well used. They are maintained by the Parish Council who employ a maintenance company. The field is inspected each month by Councillor Sue Colebeck. It is also inspected each year by the Insurance Company. If you spot anything you think needs attention please contact the Assistant Parish Clerk, Pam McMorran or any of the Parish Councillors. was the big day for the playing field. The weather was fabulous and there were a lot of people there to see the 'grand opening'. Mr. Ken Waterfall, the Parish Council Chairman welcomed everybody and introduced some of the people who have been involved with the refurbishment of the playing field: Mrs. Peggy Bown and her daughter Helen, Borough and County Councillor Mr. David Snartt, County Councillor Mr. Ernie White, Cabinet Member for Environmental Issues at Leicestershire County Council, Mr. Peter Harrod, Contracts Manager of RSS Ltd., who are the playground equipment suppliers, Mr. Mike Poole, Contract Manager for the groundworks and landscaping contractor E.M.R. Playgrounds, Mrs. Lydia Knott, Clerk to the Council, Fellow Members of the Parish Council, Mr. Malcolm Brewin and Mr. Peter Haddon who put the finishing touches to a number of jobs. Mr. Waterfall said how delighted he was to have been associated with this village project, which stemmed from the Village Appraisal in 2001, when residents and children requested better playing facilities. You may remember that we had a number of public meetings, exhibitions and tenders. The scheme put forward by RSS Ltd. was the most popular at the exhibition and they were asked to do the job. Then the fund raising began. Several applications were made to the Big Lottery, who kept us wondering and worrying for 18 months, only to refuse. However, we are most grateful to BIFFAWARDS, LEICS. COUNTY COUNCIL, CHARNWOOD BOROUGH COUNCIL, NEWTOWN LINFORD PARISH COUNCIL, NEWTOWN LINFORD PARENT TEACHER ASSOCIATION AND HIGHLY VALUED PERSONAL DONATIONS. All these were greatly appreciated and the project could not have been completed without them. Work started on the 28th April this year and despite mixed weather and difficult ground conditions it was completed in July. The grass has flourished and various finishing touches have been added to the project including signage. The finished playing field has been enthusiastically received by children and parents alike, which we hope will continue for many years to come. Mr. Waterfall then handed over to Councillor Mr. David Snartt and Mrs. Peggy Bown and her daughter Helen to officially open the Field. Mr. David Snartt thanked the Parish Council for getting the project off the ground and particularly Mr. Waterfall for his hard work in securing the grants. 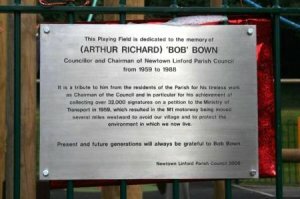 He said that the new playing field is dedicated to the memory of (Arthur Richard) 'Bob' Bown, who was a Councillor and Chairman of the Parish Council from 1959 to 1988. It is a tribute to him from the residents of the Parish for his tireless work as Chairman of the Council and in particular for his achievement of collecting over 32,000 signatures on a petition to the Ministry of Transport in 1959, which resulted in the M1 motorway being moved several miles westward to avoid our village and to protect the environment in which we now live. Present and future generations will always be grateful to Bob Bown. He and Mrs. Peggy Bown then uncovered the plaque and Mr. Snartt officially pronounced the 'Bob Bown Memorial Field' open. Mr. Bown's daughter Helen said that her father would be so proud of having the field dedicated to him as he loved the village and would have been the first to 'have a go' on the play equipment had he been there. Little Beth Raynor presented Mrs. Bown with a beautiful bouquet. Mr. Ernie White said that he was often asked "where does our money go", and he will be very pleased to give the Bob Bown Memorial Field as a perfect example of money going to a worthwhile cause that will benefit the whole community. As soon as the 'official' bit was over, children took possession of the play equipment and really started to enjoy themselves as we all hoped they would.